The Geneva II peace conference, which was seen as a chance to resolve the Syrian problem, is now teetering on the brink of collapse. Representatives of the United Nations, Russia and the United States have failed to agree on a date, according to Lakhdar Brahimi, special representative of the UN and the Arab League. There is still hope, however, that the conference could take place before the year's end, Brahimi said on Tuesday. Members of the preparatory talks that took place in Geneva have been very reluctant to comment on the differences that remain between the key players. One of the most contentious issues is the participation of Iran in the upcoming conference, which is supported by Russia but opposed by the United States. Saudi Arabia also insists that Iran should not be invited, even though Riyadh and Tehran are equally involved in the Syrian conflict through their support of the rival factions. Washington, meanwhile, does not want Tehran to bolster its international legitimacy and prestige by taking part in the Syrian peace conference. 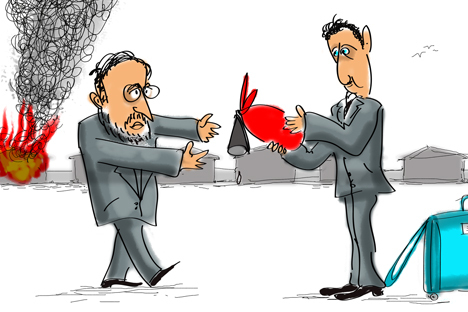 The ostensible reason not to invite Iran is that Tehran has not signed the 2012 Geneva communiqué on Syria, which forms the foundation for all subsequent steps towards a political settlement. But that seems to be just a convenient excuse. The real problem is that the Syrian opposition - or rather, the part of it that is fighting the Assad regime and enjoys Saudi and Western support - does not want the peace conference to go ahead. According to the roles informally assigned to Russia and the United States in preparations for the peace conference, Moscow must ensure attendance by the Syrian government, and Washington by the united Syrian opposition. Assad has already agreed to attend; the United States, however, has not been able to secure a similar commitment by the opposition. Of course, no-one said it was going to be easy to get hundreds of large and small opposition groups to sit down at the same table, given that many of them are fighting each other, and not just the Syrian government. But unless they agree to sit down and talk, there can be no peace in Syria. Washington hopes that the National Coalition for Syrian Revolutionary and Opposition Forces will announce its decision to attend the Geneva II conference in the next few days. According to an unnamed senior U.S. diplomat, "the Syrian opposition has come to realize that there is no alternative to political talks if the goal is to end the conflict quickly. We believe that the Syrian opposition is a lot more serious about the talks than it was four or five months ago.” The Americans may yet succeed at turning the situation around, but success is by no means guaranteed. Well aware of the possibility of Washington's failure, Moscow seems to be trying to set up a parallel track involving forces in the Syrian opposition that are more inclined to talk than to continue the bloodbath. Russian diplomats in Geneva have held a series of talks with the head of the foreign wing of the National Coordination Committee, as well as with the Syrian Kurds, Bashar Assad’s pro-opposition uncle Rifaat Assad, and representatives of the Coalition of Secular and Democratic Syrians. It was probably based on the outcome of these talks that Mikhail Bogdanov announced Moscow’s readiness to provide a platform for a meeting between the Syrian government and opposition, with the participation of foreign partners. “We used the meeting today to explain in greater detail our initiative to facilitate informal contacts in Moscow between representatives of the Syrian opposition and the Syrian government, with the participation of our U.S. colleagues and the team led by the UN and Arab League special envoy, Lakhdar Brahimi," Bogdanov said. Much will depend on progress achieved over the next two weeks. On November 25 Geneva will host another trilateral preparatory meeting between American, Russian and UN diplomats. Meanwhile, the humanitarian situation in Syria is rapidly deteriorating. The end of 2013, which has been set as a symbolic deadline for holding the Geneva II conference, will actually be an important threshold. If no progress is achieved by then by the parties pushing for peace talks, Syria could well set off irreversibly along the path to somalization, i.e. an uncontrolled disintegration of the country. Desperate as things are now, somalization will be even worse. In fact, the process could be even more prolonged and destructive than in Somalia itself, the UN special envoy believes.